The relationship between the electrical inspector and recognized testing laboratories and field evaluation bodies (FEBs), as recognized by the inspection authority, is one in which the latter generally provides a service to the former. The reverse is also true where the inspector is the last set of eyes ensuring products are used correctly, however, by and large, the first assessment holds. For the testing laboratory or field evaluation body, if the inspector observes something that seems incorrect, the testing laboratory or FEB wants the inquiry from the inspector so all can agree with the goal being a safe installation. Certainly, the valuable services of testing laboratories and field evaluation bodies greatly assist the inspector in the discharge of his legal responsibilities in the protection of the public from hazards which may be associated with the use of electricity. The primary functions of the recognized testing laboratories and field evaluation bodies are that they both perform product safety testing, such as evaluating and certifying the safety of electrical equipment to the applicable product safety standards. However, how these organizations conduct their evaluations can be quite different. How products or equipment are certified is also different, in that the testing laboratories perform their inspections primarily in their laboratory facilities or at the manufacturing location, while field evaluations may start at the manufacturer but are generally finalized in the field where the equipment is installed. For the field evaluation process there is an additional step with completing and issuing a formal test report to the client and the AHJ. Recognized testing laboratories and field evaluation bodies all use certain terminology to indicate that a product has been either authorized by a certification agency (Listed and Labeled), or that conformity has been achieved with a “field label.” Marks and labels indicate, for example, that the certification requirements by a testing agency have been met. Approved. Acceptable to the authority having jurisdiction (NFPA 70, p. 33). Listed. Equipment, materials, or services included in a list published by an organization that is acceptable to the authority having jurisdiction and concerned with evaluation of products or services, that maintains periodic inspection of production of listed equipment or materials or periodic evaluation of services, and whose listing states that either the equipment, material, or service meets appropriate designated standards or has been tested and found suitable for a specified purpose (NFPA 70, p. 38). Informational Note: The means for identifying listed equipment may vary for each organization concerned with product evaluation, some of which do not recognize equipment as listed unless it is also labeled. Use of the system employed by the listing organization allows the authority having jurisdiction to identify a listed product. Labeled. Equipment or materials to which has been attached a label, symbol, or other identifying mark of an organization that is acceptable to the authority having jurisdiction and concerned with product evaluation, that maintains periodic inspection of production of labeled equipment or materials, and by whose labeling the manufacturer indicates compliance with appropriate standards or performance in a specified manner (NFPA 70, p. 38). Field Evaluation. The process used to determine conformance with requirements for one-of-a-kind, limited production, used, or modified products that are not listed or field labeled under a certification program [NFPA 790 – 3.3.3.]. Field Labeled (as applied to evaluated products). Equipment or materials to which has been attached a label, symbol, or other identifying mark of an FEB indicating the equipment or materials were evaluated and found to comply with requirements as described in an accompanying field evaluation report [NFPA 790 – 3.3.6]. Example of Marked Product. Example of a fuse and label that shows the interrupting capability of this device. Note that the device has a marking label from both CSA Group and UL. Marking or Certification Mark. A certification mark is evidence that a product has been certified by a testing and certification agency. Each recognized testing laboratory and field evaluation body has its own certification or evaluation mark, which is placed on products or equipment to indicate that a product has been thoroughly tested and has been found compliant with the product safety standard. Products that bear the UL mark, for example, are intended to verify that the product is a UL listed product. These NRTLs are authorized to perform testing and certification activities for the standards in which OSHA recognizes them for products and equipment going into the workplace. It should be noted that not every NRTL is recognized by OSHA in every standard from the OSHA list. These organizations perform safety testing and certification of materials and equipment as specified in the General Industry Standards (Part 1910 of Title 29, Code of Federal Regulations – 29 CFR Part 1910) to manufacturers. After the testing and evaluation is successfully completed under the NRTL program, manufacturers are authorized to apply a registered certification mark to the product; this mark indicates that the product complies with the requirements of one or more appropriate product safety standard. The NRTL then completes periodic factory visits to ensure that products carrying the laboratories Mark continue to be compliant with the applicable standards and listing report. A final note on OSHA. As stated OSHA enforcement is for safety in the workplace and that enforcement is accomplished by OSHA inspectors at the State or Federal level. For the local (State, County, City, Municipal or other) the requirement for use of Listed and Labeled products and equipment is from the adoption of the National Electrical Code, NFPA 70, and from individual legislative action by that jurisdiction. The local inspection authority is separate and will adopt or recognize suitable testing laboratories separate from the OSHA recognitions, even if they may be the same entities. It should be also noted that OSHA does not recognize FEBs. Being a NRTL does not automatically qualify someone to also be a FEB.
To assure compliance with applicable product safety standards, an investigation is needed to confirm that the products meet the applicable product safety standard. This ensures safety to the degree provided by the consensus standard. A testing laboratory uses a series of steps to make the determination if a product is ready to be manufactured for wide use. The following is a general workflow path that NRTLs use in investing that a product is compliant. 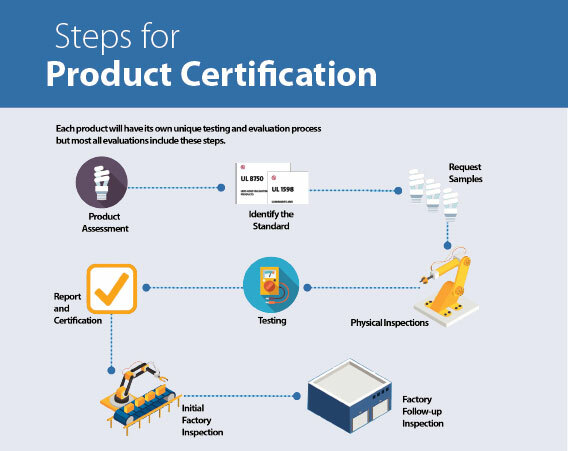 Each product will have its own unique testing and evaluation process but most all evaluations include these steps. Product Assessment. Identify the product or equipment to understand its intended use, how it is generally constructed and what environments might it be exposed to. Initial Review. 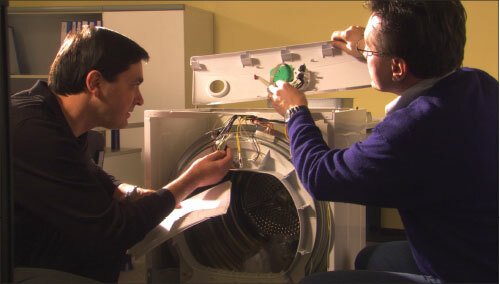 A UL product engineer and reviewing engineer evaluate the construction of a clothes dryer during their preliminary review of the product for compliance with the safety standard. Identifying the Standard(s). Once the product or equipment is understood the next step is to determine the applicable standard. To properly investigate all potential hazards, locating and applying the correct standard is critical. Some products, such as a computer being connected to and made part of a piece of medical equipment, may have to be investigated in multiple standards. The location (environment) of where the equipment is used may also bring about another standard. Lastly, any critical components that are not already investigated and certified, may require use of the applicable standard for that component. Compliance Standards. A UL project engineer and reviewing engineer conducting a preliminary review of a medical monitoring system for compliance with the safety standard. Samples. Once the standard is determined, a number of samples of the product may be required to complete the inspection and testing phases. Sometimes only one sample is needed, but in many cases because of the required disassembly or destructive nature of some tests, many samples may be required. Also some tests need to be repeated to verify consistent performance under the testing conditions specified in the standard. Physical Inspection. After the standard(s) has been identified, the product is physically disassembled and inspected to the degree necessary to validate construction to the standard. Components are investigated to assure that they are recognized and applied correctly in the product. Other physical inspections include measuring clearances and creeping distances between live parts. Inspections can also include an evaluation of mounting, bracing, overall strength and suitability of the enclosure(s). Lastly, electrical safety with regards to conductor ampacity, grounding, overcurrent protection, abnormal temperature protection and similar characteristics are investigated. Testing. Testing is performed on the product in accordance with the requirements of the standard both in normal conditions and in abnormal conditions. Temperature tests are conducted by blocking air passages, disabling fans or other similar situations to create excessive temperatures. Other tests may include surges, overvoltages, or environmental tests such as vibration, temperature, and humidity tests. In some cases devices are shorted or blocked to validate the overcurrent or other protective means incorporated. A physical inspection cannot detect the items uncovered during the testing phase, so it is an important step. Testing. 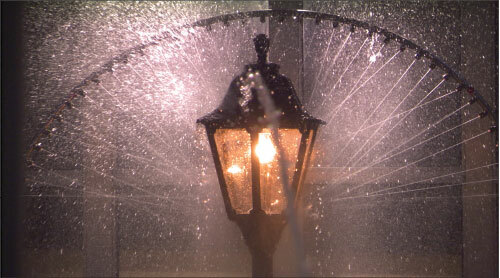 A wet location luminaire undergoes an ingress protection rain test to achieve an IP (ingress protection) rating on the luminaire. Report and Certification. When all inspections, testing and evaluation is satisfactorily completed, a detailed report is generated for the listing file holder and the testing laboratory. This report becomes the basis for future follow-up inspections and is quite detailed for critical components, assembly details, diagrams, illustrations and other data needed by both the manufacturer and the testing laboratory. Lastly, a “certificate” also known as a Notice of Authorization is provided to the manufacturer. With the notice of authorization, the manufacturer is then allowed to produce products and apply the certification mark. Initial Factory Inspection. After the initial product passes the laboratory tests, manufacturers must continue to produce and ship products that meet all the requirements and be equal to the product approved in the laboratory. For a new factory or one producing a new kind of product, the authorization to label and sell a product is not complete until an inspection at the factory has been finalized. It is also necessary to determine that the manufacturer can continually make the same product as was originally approved. Factory Follow-Up Inspections. After the testing laboratory has performed the above items, they need to perform random and unannounced periodic visits to the factory to ensure that the product continues to comply with the standard. This may be a full audit of the product or a review of the manufacturer’s quality system with some product auditing. For some products, periodic samples are taken from the production line and sent back to the testing laboratory of a modified testing program to provide added assurance of compliance in the performance of the product or equipment. There are times when changes or modifications are desired or become necessary during the manufacturing. For example, if a component manufacturer can no longer continue to supply the exact part that was initially approved, the manufacturer must let the lab know of the change and get explicit approval for the substitution. OSHA inspectors are to look for the Mark from the NRTL. Under the OSHA program, this assures safe products within the workplace where OSHA has jurisdiction The jurisdictional inspector should always look for a label from a recognized electrical testing laboratory that identifies the correct standards, performs a thorough investigation, conducts initial factory inspections and requires periodic follow-up inspections (see the NEC definition of Listed above). When there is no Mark, the inspector should reject the installation until they can be satisfied by a recognized testing laboratory that the product or equipment meets the applicable product safety standard. In many cases some sellers of equipment or manufacturers will produce a page from the testing laboratory listing or the notice of authorization. This does not assure that the product or equipment in question was in fact manufactured and shipped under the testing laboratory certification. The Mark is the evidence from the manufacturer that the product is certified and is under the follow-up of the recognized testing laboratory. The value for inspectors is that it saves the inspector from trying to independently determine if a product is “safe” and can be installed as part of an “approved” electrical system. After the manufacturer has assembled the product and shipped it from the factory, the product generally passes through some form of distributor to the installer. This supply chain can be via the importer, contractor, end owner, design professional or other paths. After installation and approval by the inspection authority the product or equipment is fully connected to the local electrical supply system for subsequent use by the consumer. Through its testing, listing, and subsequent factory follow-up services, recognized testing laboratories render a distinct service to each of these parties. As stated previously the installation to the adopted Code depends on products and equipment that have been manufactured and listed to the correlating product safety standard(s). In most cases, the manufacturer benefits by producing a product which causes fewer, desirably no, fires, electric shocks, and accidents than might otherwise be the case. Undoubtedly the greatest service rendered to the manufacturer is the assurance of almost universal acceptance by inspection authorities. Without this broad acceptance, the manufacturer could not enjoy the benefits of mass production and distribution. 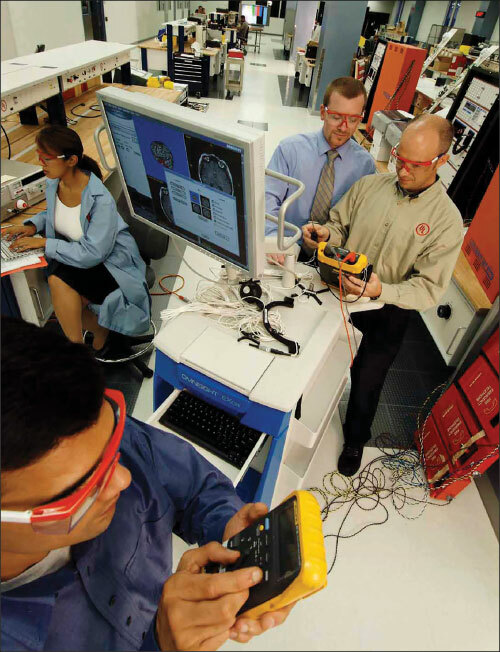 Because of its position in the electrical industry, testing laboratories such as UL operate to serve as a balance and bridge between the potentially different views of the inspection authority and the manufacturer. Merchandising a product built to a nationally recognized safety standard also improves its position with respect to product liability insurance, and even before the courts, in the event of legal action arising out of the use of the product. Since the importer or distributor is in the flow of commerce, the likelihood of being potentially involved in legal action arising out of use of the product is also reduced, because the product is less likely have an incident leading to a lawsuit. The distributor can also proceed with the marketing operations with better assurance that the product will not likely be returned because it is unacceptable to the local inspection authority due to the lack of having the required certification. It has been said that the contractor bets on each installation job that they can make the installation satisfy the requirements of the NEC as interpreted by the local inspector. By use of listed and marked products, even if the cost is slightly greater, the contractor has taken the best insurance that is available in this regard. Recognized testing laboratories’ listing of wiring materials and other components of a wiring system also serves to classify the components so that they might be properly installed per the provisions of the codes. Like the distributor, the contractor is provided with a floor for a certain safety level of quality in the products and materials as a safeguard against progressively inferior products entering the marketplace. Electrical inspections are a necessary process to protect its citizens from hazards of fire and shock in the same way that the policeman protects against traffic hazards and crimes, or the public health official protects against contaminated drinking water or spread of infectious disease. This responsibility is given to the inspector by local ordinance and includes the safety of the equipment as well as the installation. In most cases, the AHJ does not have the time or facilities to make a proper evaluation of the many products and equipment used in any installation. In addition very few AHJs have the technical expertise and testing facilities to conduct the product evaluation as outlined above. Hence, the AHJ is generally glad to share a part of his responsibility with a recognized testing laboratory. In some cities, the inspection authorities have instituted sales control laws governing electrical products which require that all products offered for sale or installation in their territories meet the product safety requirements of a recognized testing laboratory. The public utility is naturally interested in promoting the maximum use of electrical energy. Any program that lends to providing safe electrical appliances and materials, so long as it minimizes an increased cost of the product so as to discourage purchasers, serves the interest of the Utilities. Also, to a degree, the Utility Company may have some legal responsibility for certain equipment connected to its lines, and again, any reduction of fires or accidents also serves this interest. Last, but by no means least in the chain, is the public. The main benefit to the user is that the listed electrical product offers reasonable assurance against fire or electrical shock destroying property or injuring employees or family. Certification by testing laboratories are in no sense a warranty or guarantee, but rather a declaration that the design of the product conforms to the consensus standards and requirements for the listing. The testing laboratory does not purport that it tests or examines each and every unit that is produced since to do so would simply make the cost of the service prohibitively expensive. The listing does contemplate that the manufacturer will conscientiously carry out his own inspection and quality control programs, and will thereby apply the testing laboratory marks only to those units found to comply fully with the listing requirements. Inspection of the factory production by the testing laboratory follow-up field teams are primarily to spot check the manufacturer’s own inspection and control program. The electrical equipment falling under most of the testing laboratories scope of operations does not include equipment generally used by a public utility in generating and distributing electricity, although that is slowly changing. But some testing laboratories do evaluate large power production and distribution equipment. This aspect has grown in recent years with the advent of alternate energy systems, primarily photovoltaic and wind with privately owned producers that sell the electrical energy to the utility distribution system. There are some that believe and promulgate the false information that testing laboratories do not cover products above 600 or 1000 volts. This is not true and a number of power production and distribution products, such as alternators (15 KV), transformers (69 KV), switchgear (25 KV), and circuit breakers are available listed for medium voltage applications. In this regard, testing laboratories seek to make its services available to cover those products and materials used by the public, thereby, fulfilling their primary obligation, which is testing for public safety. Field Evaluation Bodies (FEBs) are organizations that perform field evaluation of electrical or other types of equipment as per the NEC. NFPA 790, Standard for Competency of Third-Party Evaluation Bodies (FEBs), defines a field evaluation as “the process used to determine conformance with requirements for one-of-a-kind, limited production, used, or modified products that are not listed or field labeled under a certification program” (NFPA 790, 2018). The basic functions of an FEB and NRTL are the same, as they both perform product safety evaluation of the electrical equipment to the applicable consensus product safety standard. Both entities are there to support the authority having jurisdiction to make the “approval” decision. As discussed above, testing laboratories provide product safety testing and certification primarily at the point of manufacture while the FEB provides the service ultimately at the point of the final installation. One other point of interest is that product testing laboratories, like UL, have been around starting about 1894, or over 120 years. Field Evaluations are relatively very new, with this process starting in the late 1970s and rapidly evolving since that time. The standards that apply for FEBs are ANSI/NFPA 790 and ANSI/NFPA 791, Recommended Practice and Procedures for Unlabeled Electrical Evaluation Equipment. The FEB must have the capability to provide product safety evaluation including limited testing and labeling primarily in the field. Many of the NRTLs also provide field evaluation services, but OSHA does not certify FEBs and does not accredit NRTLs to provide FEB services. Field evaluations are useful for inspectors when they are presented with a questionable piece of uncertified or unlisted equipment. This is a product or equipment that does not bear a mark from a recognized testing laboratory. For example, a product may bear the mark of a foreign country certification body, not recognized in the United States, or bear a “CE” label which is a self-declaration for use only in the European Union which also is not recognized in the US. Field evaluations are also useful when certified equipment has been modified after installation or has been repaired, reconditioned, refurbished, or remanufactured in a way that its features and designs have been changed since the original listing. While field evaluations are a good way for the local inspector to get help with dealing with “uncertified” products and equipment, it is still incumbent on the local inspection authority to ensure the FEB is truly qualified to evaluate the equipment, and to insist that in addition to any label applied, the accompanying engineering report is provided directly to the AHJ from the FEB.
A well-organized process using the appropriate testing laboratory, and appropriate standards from UL, CSA, IEEE, and NFPA can be invaluable and critical in assisting with the decision-making process to ensure safe installations to the adopted codes and standards. Since listings performed by recognized testing laboratories and field evaluations conducted by recognized FEBs are based on product safety standards, an inspector will have information about the standards to which a product has been listed or labeled or evaluated by looking for an NRTL mark or FEB label. Recognizing these labels ultimately saves the inspector’s time in the process of evaluating and approving the overall installation including the installed electrical equipment. For the field inspector, listed products should be the first choice, and only when a product does not have a listing or when it is modified, then a field evaluation may be appropriate. Laura L. Hildreth has worked in editorial and technical publications within the electrical industry for eighteen years, the technology industry for over twenty years, and the news industry for even longer. An investigative journalist and writer by nature, she is also a researcher, writer, visual designer, web developer, planner, educator and all-around tech geek. Her passion is encouraging communication and learning no matter what the tool—from pen and paper to interactive apps. Connect with her on LinkedIn at www.linkedin.com/in/lauralhildreth.